The Fokker F.XII was a three engined high-winged monoplane airliner produced in the 1930s by the Dutch aircraft manufacturer Fokker. Two aircraft were built under license by Danish Orlogsvx�rftet. 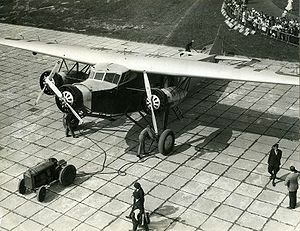 The first was powered by 347 kW (465 hp) Bristol Jupiter VI radial engines and the second, an improved model, the F.XIIM, was about 20 km/h (12 mph) faster than the Dutch-built F.XIIs.